In most cases, technology is a wonderful thing. In the case of mobile phones, it allows us to speak to a loved one wherever we are or easily find a good restaurant to eat at in an unfamiliar place. But this technology has its negative effects too. A new article in the Denver car accident attorney knowledge center explores these effects as well how to go about proving fault and obtaining compensation for your injuries and damages. 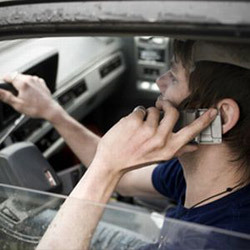 Talking or texting on a cell phone while driving accounts for 25% of all car accidents in Colorado and across the U.S. Despite all of the warnings and even laws against their use while driving, many Coloradans and Americans continue to talk or text while driving. These facts alone should give any driver pause…but too many don’t and use their phones despite statistics like these and many others. So inevitably, accidents do happen. If you’re in an auto accident in Colorado and the at-fault driver was using their cell phone, you may entitled to compensation for your injuries and damages. Regardless of fault though, the first thing you should do is make sure you and any passengers or other drivers obtain medical attention. Call the police and file an accident report and if there are any witnesses, get there contact information for any potential testimony. You should also take photographs of the accident as well. Keep in mind though that you can be on a cell phone and the accident still be the other driver’s fault. In these cases, your settlement amount could be reduced. Irrespective of this though, you should never talk on your cell phone while driving. To learn more, check out our newest article Car Accidents and Cell Phones – A Dangerous Mix in the Denver car accident attorney knowledge center today. And if you’ve been involved in an accident where the at-fault driver was talking on their phone, contact Denver car accident attorney R. Mack Babcock and associates at the Babcock Law Firm today for a free consultation.